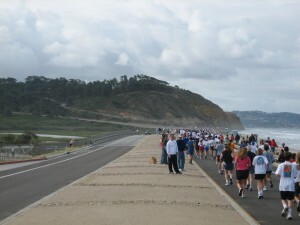 My running groups usually train for La Jolla Half Marathon in late April every year. One question I always receive is “where do spectators go”. Having been involved with this race for quite a long time, I’ve got my little routine that works every time. There is not a whole lot of information about spectators on the race website and what the best plan is, so I’ll give you my best experiences as I’ve watched a few of these in my time ;) With most large races that span a large area, most spectators can only get 2 or maybe 3 areas of viewing due to the mere time it takes to drive around town, navigate traffic, park, etc. Drive to the start area which is essentially the Del Mar Fair Grounds. Super . . . now you have given a ride to your runner. You can hang out in the lot with everyone and see you off at the start of the race. After the race start, quickly get back to your car and drive south on I-5, exit Carmel Valley Road and head West. Turn left on McGonigle Dr and enter Torrey Pines Park (may be an entry fee if the gate is manned) You can park at the end of the lot and get up onto the Coast Highway. This is approx mile 5 in the race. Watch your time . . . figure you have about 50 minutes from race start if your runner is at 10min/mi – adjust as necessary based on the pace of your runner.) Once done there, head back down to La Jolla and get as close to the cove as possible. Again, you’ll have about 7’ish miles worth of running (60-70 min?) to get into La Jolla, parked and walking to the cove.